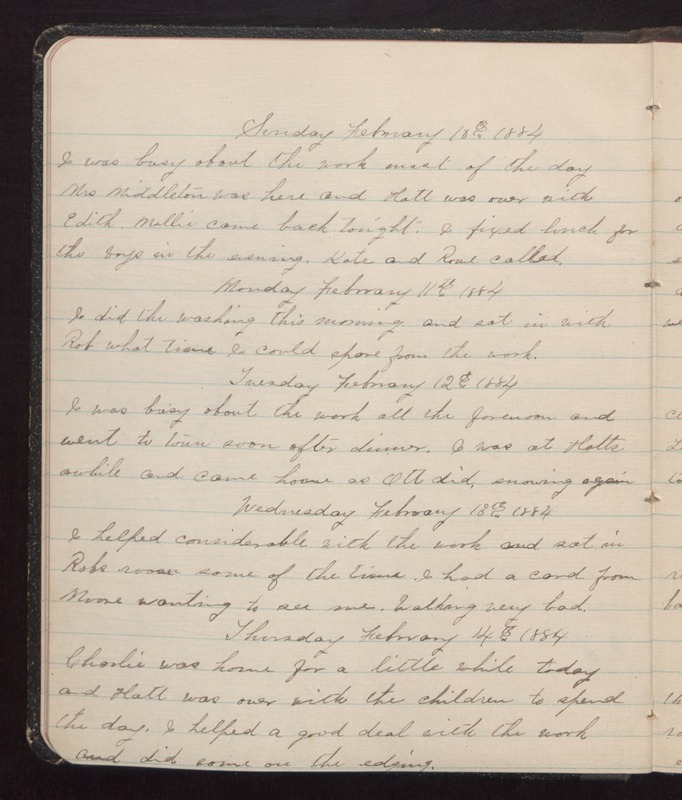 Sunday February 10th 1884 I was busy about the work most of the day. Mrs Middleton was here and Hatt was over with Edith. Mollie came back tonight. I fixed lunch for the boys in the evening. Kate and [Rowe?] called. Monday February 11th 1884 I did the washing this morning and sat in with Rob what time I could spare from the work. Tuesday February 12th 1884 I was busy about the work all the forenoon and went to town soon after dinner. I was at Hatts awhile and came home as Ott did, snowing again. Wednesday February 13th 1884 I helped considerable with the work and sat in Robs room some of the time I had a card from Minnie wanting to see me. Walking very bad. Thursday February 14th 1884 Charlie was home for a little while today and Hatt was over with the children to spend the day. I helped a good deal with the work and did some on the edging.